Great Generator for the price, started first go and extremely quiet. We purchased this to run our Caravan air conditioner and it does the job very well. Super fast delivery, great price with bonus added extras and a $150 visa gift card. Would defiantly recommend My Generator to our friends. "Top product and very impressed with service by My Generator"
Yamaha always make quality products and this is my second Yamaha generator. My Generator are great to deal with and provide exceptional delivery times combined with the best price. Very easy to use very quiet not to heavy very happy with the yamaha generator. I had been shopping around for a while and found this to be the best price. And delivery was quick aswell. The generator came as advertised. I am glad I ordered the extras which included oil (and cover) otherwise it would have been some time until I was able to start and test the generator because I am a long way away from town (and oil) and only go in every week or so.. 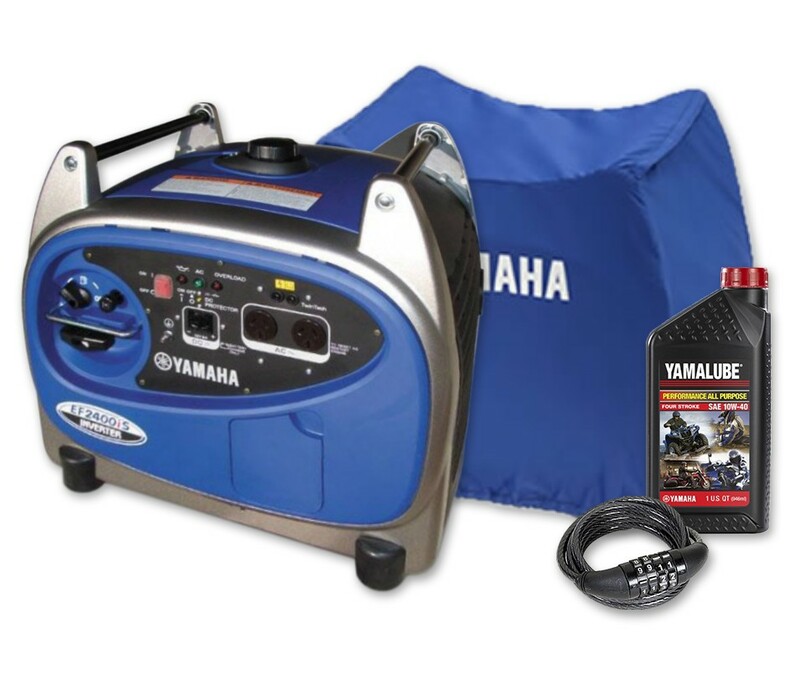 Currently FREE with the EF2400iS Yamaha generator purchased between 01/02/2019 - 18/04/2019, is a $150 Prepaid Visa Card! If you’re looking for a top of the line generator for your caravan or motor home, then look no further than the Yamaha EF2400iS. It’s a powerful unit, delivering a maximum output of 2400W and continuous of 2000W, making it a common choice for those wanting to run some larger appliances on the road such as air-con units, microwaves or washing machines. It is suited to run most caravan air-con units on the market, as many a/c units will peak at more than 2000 watts. In fact, the EF2400iS was the winner of the Caravan & Motorhome On Tour Magazine’s Mega Portable Generator Comparison, whereby they tested 13 portable generators across six brands. Despite its powerful output, this unit’s sleek and lightweight design still makes it mobile to move around at your convenience. Additionally, the large engine capacity does not mean this is a noisy machine - quite the opposite: the Yamaha noise reduction technology means it only produces a mere 53 decibels! That makes it quietest in its class. Like all units in the Yamaha inverter range, the voltage produced is pure sine-wave, making it perfect to run all your sensitive electronic appliances such as laptops, tablets, televisions and mobile phones. Also included is the sophisticated Yamaha Smart Throttle technology which controls the engine speed in line with the required output, ensuring maximum fuel efficiency - it will run for 9 hours at a quarter load. Yet another feature on this model is the Twin Tech capability to give you more power if required: you can simply hook up two EF2400iS generators together and they will produce almost double the maximum power output and provide 3800 watts of continuous power. To complete the perfect package, the unit is equipped with spark arrestor and a low oil shut-off system as important safety features. Yamaha is one of the world leaders for engines and power equipment, and for your peace of mind their generators come with a 4 year warranty and are backed by a national service network of over 200 accredited service agents. This unit is not only the premium choice to run your Caravan, but many customers also select this model to run their fridges, lights and other small to medium home appliances during a blackout. TwinTech™ capability. Hook up two EF2400iS's to almost double max power and for 3800 watts of continuous rated power. Noise Block™ sound reduction system. Whisper quiet. Delivered in 4 days which included the weekend, so excellent service, filled with oil and fuel and started in 2 pulls. 2 the security cable is absolutely useless and is not worth the $60 as advertised, you can get this cable from the bicycle section of Kmart for under $10. Really great product. Works well and is relatively quiet given it is a generator. A bit heavy for me as I need a fella to help lift it. I wasn't sure what size generator I needed to run an airconditioner but the customer service agent discussed my needs and advised on the right size. The price was great and I got a discount which always makes me happy. Couldn't fault any part of the process. Delivery was really quick as well. No problems with any part of the service. Very pleased with Yamaha Inverter Generator, set it up per instructions and it has started first time each time & It runs either the fridge, freezer & Air-con with ease . The only little extra item was having to provide an earth lead so I could connect the Generator to my earthed appliances, but after a bit of handyman ingenuity with part of an old tent pole and some power lead & soldering etc - all fixed. Great site for buying on, with good backup from their team for requested info. Very efficient staff, happy to explain all about the product, delivery was very quick. Arrived when told it would. In my experience it is very hard to fault Yamaha products, as over the years they have proven to be well engineered, cleverly designed to be both user friendly, reliable and highly functional. The Yamaha 2400W Inverter is an excellent mid sized generator for multiple uses, and with enough 'grunt' to cope with the starting current required for a large range of equipment. The staff at My Generator are excellent, and phone queries are handled very efficiently by people who know what they are talking about. Most impressed with the purchase experience and the speed of delivery of the product. The unit is pleasant to look at. Very quiet when running. Easy to operate. The fuel gauge is great, easy to read. In Quilpie we have power outs and now we have a back up when power is out, then we are going on around Australia caravaning trip soon and I feel this will be the best unit for the job. We have a Yamaha 25hp out board for the boat, a Yamaha quad bike, and had a very good run with these. So this is one reason we went with Yamaha, plus if I have any problems with the unit I only have to find one dealership. The sales person was very helpful and easy to talk to. Being a retired electrician I worked out what size I required, also the sales rep supplied me with physical sizing so it would fit in the generator locker on the caravan. He then arranged to have the unit delivered to a address in slacks creek for me, so I could pick it up when I come east. And that saved me on freight costs. The brand name gives you confidence you are buying a product that can be relied on day in day out. Easy starting , silent running, capable of running many appliances at once, it is the perfect generator for our 240V needs whilst traveling Australia in our caravan. Flawless assistance with our enquiry , amazed at how quickly the unit was delivered. Arrived well packed on our doorstep. Size and noise level is great and can't wait to test it in the field. IT FIT AWAY IN THE STORAGE HOLE WHERE MY OLD GENSET WAS I CAN LIFT IT IN AND OUT WITH NO STESS AND IT RUN MY AIRCON , HOT WATER, HOT PLATE, AND MIROWAVE. TOO EASY GREAT SERVICE AND ON TIME ARRIVAL. This is a very good and reliable generator. It starts first or second pull every time and runs quietly. Power is very stable and I am confident in running my more fragile electronic appliances but still running the air conditioner on my caravan, using the generator. It is everything that Yamaha claim it to be. Well done on a good product. My experience was as I would expect it to be from a well known, reputable company. The communication was good as was delivery service. Already had generator, only purchased extras pack consisting of Yamaha Genuine cover - $80, Yamaha 1 litre of oil - $25 & security cable - $65. Price was great, tried finding security cable on My Generator website for more info but couldn't, being $65 I thought it would be a decent cable. Received my items, overall very happy as price was very good & postage very quick, however bitterly disappointed with security cable, there is no way known that this 106cm Cyclops bicycle security cable is $65, no one would ever pay this amount, similar cables on EBay & Bunnings - well under $10. As overall price was excellent I am a happy customer, however feel let down that My Generator would say the included security cable would be RRP - $65, they need to explain what the security cable is & show a proper value for this $8 cable. I was kept informed of my purschase of a generator by email and on arrival at your local depot for pick up, no worries. On line order was no problem and too easy to do, with confirmation by email and later a phone call when it arrived. Filled with oil and fuel, Started first pull!! Very quiet. Runs caravan air-con easily. One very happy camper. Great phone service. Prompt delivery, arrived in perfect order with all extras as promised. Was recommended to purchase the bigger 2400w Inverter for caravan air-con and haven't been disappointed. Fantastic before and after sales service. Follow - up phone calls once order placed to ensure correct delivery details was a welcome surprise. The whole process was worry free. Will definitely buy from My Generator again and have recommended them to family and friends. I am very happy with the performance of my new Yamaha 2400w generator, It runs my 2.4kw air conditioner and my caravan with ease, Its good on fuel and reasonable Quiet and easy to start. Placed order Sunday, Delivered by noon Tuesday. After alot of research, we decided on the Yamaha 2400 generator. It handles our caravan air con easily, runs quietly and starts first pull every time. My generator had the best price l could find. Was delivered in a few days. They kept me informed of the progress of the purchase and delivery. Highly recommend My Generator, will use them again. This is top of the line product. Runs my fridge, TV, fans & has some more capacity. Excellent product. Very easy to deal with. Shipping was excellent and generator arrived earlier than expected. Bought this generator for home back-up on power outages. Start up was very easy and simple. Trialed unit by plugging in fridge and light, opened fridge and freezer doors for 5 minutes to make sure it would start the compressor, there was no change in generator revs or noise level, so added a five inch angle grinder to the load, again no noticeable change in revs or noise level. Rang My Generator to place an order. Confirmation email received almost immediately. The delivery was very quick, a day earlier than I expected. The whole process was easy and professional. Generator is very quiet to operate and easy to get started. I feel it is good value for money and I love the 4 year warranty that comes with it. In the process of an around Australia trip in the caravan and this will make free camping easier. Guys were great to deal with.They answered all the questions I asked. My purchase was delivered promptly and no hassles. Very happy with the yamaha 2400 generator. Fantastic correspondence and help from My Generator. A+ service. This generator runs the A/C unit with ease and it is very quiet. It's the first 'Yamaha ' generator we have had and we are very impressed with its quality and performance. Excellent user friendly website with plenty of product information. Great service and very prompt delivery. We bought this to run our air conditioning in our caravan and it does without any effort. Its also very quiet, wouldn't know it was running until you walk up to it. These guys are awesome it was delivered in four days and that includes the weekend. Very easy company to deal with and best price you will find anywhere. I have a 20' van and have for the past few years run all of my A/C power requirements with a 2kv Honda. I found that although the Honda would power the Aircon it would have to operate at full noise which was neither good for the genny or any fellow campers! I had read all of the reviews on the Yammy 2400is and decided to get the extra wattage. I am impressed with the difference with the van running a 7 stage battery charger and Aircon, the Yammy slightly rev's up from idle (which is around the idle of the Honda 2kv anyway, the Yammy is noticably quiter on idle than the Honda). The Yammy 2400is is bigger in physical size than the Honda but I can live with that. 4 year warranty on a already quality product was also impressive. I called Sean with some questions that I had and within 10 mins he had given my all of the info required to make my mind up. He sent me a quote within the hour (which was far cheaper than any other business I could find) we made the deal that afternoon. The delivery was also very fast delivered within 4 days of payment. By far the easiest purchase I have made. I have only had the generator a short time and its doing the job very well so far. Quite happy with it. The delivering of the generator was very fast, Top self service I'm very pleased with the service. We decided to purchase this generator after doing some research into what size geny would run our caravan air con and other bits n pieces. Originally we were advised that we needed a 3000w but have since found that this is the right one. The generator started first go and is all that the blurb says it should be, quiet, reliable and economical. We are travelling around Aus in our van and we are very pleased with our purchase. Purchasing our generator from My Generator was extremely easy to do and the whole transaction was a breeze. Delivery was within the time frame stated. Product arrived in excellent condition. All in all a very simple transaction. Couldn't have purchased a better product. The 2400w inverter generator is so efficient, quiet and reliable, i am very impressed. Shopping with My Generator was fast and efficient. I look forward to dealing with you guys in the future. After many years as commercial deep diver, this machine is easily the best for this lightweight work. As are most Yamaha Products we use in maritime work. Fast delivery, easy contact will certainly use again, hassle free and helpful. I have worked all over the world in my diving scene and mygenerator is one of the best. Ronald. Ordered unit and was happy it arrived within the allocated time frame. Excellent service and quality of product. Performed well. Review by Donald Bynes , Littlehampton S.A. It really performed exceptionally well against other makes in the caravan parks we visited and it ran our air conditioner and other appliances without any trouble. Very good, we ordered and paid for it and it was delivered within a few days. Well done! This unit is used to power a shed that is 120 metres from the house and to run a pump which delivers water from the co-located shed water tank to the vegetable garden. Perfect for the job! A marvellous shopping experience with My Generator initiated receipt of the generator. I found this product the best choice as we have a caravan and even though they say the others will do the job, just not there like this one for running a caravan with air con, etc. We were amazed and the quiet technology and easy start up in a light, compact unit. We used this during our trip around the NT and WA and it did not miss a beat. Not a better brand or price for this unit around. I found this generator easy to start and quiet when running. I can recommend the Yamaha 2400w inverter generator. I found the people at My Generator easy to deal with and received the generator within a week. Great stuff guys. The generator started on the very first pull of the cord. Very satisfied with the product in both quality and finish. It is for use on camping trips to remote areas to help keep all batteries charged especially in connection with air conditioner unit. Very good company to deal with, especially on the chat line. Helpful and more than willing to assist in meeting your budget price. Would recommend this organisation and certainly will use them again. They had the best price on a quality product. Delivery time was better than expected. Thank you for everything. Love the product and have no problem in recommending this model. Easy and no problem dealing with the company. I did a lot of research prior to purchasing my Yamaha 2400 generator, it has fulfilled all my requirements in being able to supply my caravan while free camping, including running air con which it handles without a hitch. I approached several suppliers prior to purchasing my generator and the experience of dealing 'My Generator ' was far better than I expected and the price compared to many other sites was great. Quiet, powerful, great fuel economy. This generator ticks all the boxes. Whether camping, boating or powering the shed up at the block, this does it all. Value for money here no doubt about it. Easy simple operation and the additional 12v comes in handy. Highly recommend. Simple, placed the order and had it in 3 days. Prompt service with tracking notification. Thank you for everything. What a great company to do business with, had my generator within 3day's would highly recommend them to anyone. Perfect generator - started straight outta the box - simple to use - and handled my older style power guzzling air conditioner start up in my van on it's ear. Super quiet too - couldn't be happier!! Reckon it turned up a day or two after I ordered too. Rang Sean a few times throughout the shopping around process with questions and he was great - helped me find the right size and nothing was too hard!! A pleasant change in this industry. Excellent service, online chat secured the sale and a quick sale was had. Did my research and they were extremely helpful. Very quiet as described. Very happy. We can only give our new 2400w generator ticks and more ticks. It preformed above what we had hope for. We use it on caravan trips and it provides all the power we need. Thank you My Generator shop for quick no hassles service. We are very impressed with the Yamaha geni. We use it in our caravan for backup or to run the air conditioner on hot days. We love free camping and the geni allows us to camp where and when we want. Starts first pull. Went camping on the weekend, the generator was quiet, it ran our 10000 BTU air con easy and the wife can even start it. A happy and healthy family all round. Thanks heaps. Go Yamaha!! Steve was easy to communicate with, has a lot of knowledge and I was very happy with the service that was provided. Starts first time, very quiet and uses basically no fuel. Called My Generator and they answered quickly. Confirmed stock was arriving next week and it was delivered in a couple of days. Quick, reliable and a good shopping experience. The price was also the cheapest I could find anywhere online. Very quiet, easy to start, one pull. Just love this machine. Wife can even start this generator. Runs everything that I want to use on our caravan, very happy chappy thank you Yamaha. After doing extensive research on the most reliable, mobile generator on the market, I read a thorough review in Caravan & Motorhome magazine which confirmed that the Yamaha 2400w Inverter Generator is the best quiet, serviceable, fool-proof unit on the market today (level with the HondaEU30i - but $1,000 cheaper). I haven't put any real rpessure on it yet, but so far so good! The wife can now run her hair dryer, toaster and air conditioner without chewing away battery power, making my camping experience much more pleasant! We are very happy with the product and service your business provided. We would highly recommend this generator to others. Replies to emails were handled in a prompt and efficient manner. Excellent experience with no suggestions for improvement. Already have a big noisy 6.5KW Honda generator for work. This new Yamaha 2400 inverter generator is ideal for most hand tools and big enough for our caravan A/C and sensitive appliances like laptops and front loader washing machine . My shopping experience with "My generator" was great. They retuned my call, Discussed my needs, Answered my questions, Processed my payment on Friday, Delivered my unit on Monday. Most businesses could learn from these guys ! Very good service from the supplier. I am pleased. My neighbor recommended this unit as he's had one for years for his Caravan and it is a quiet, easy to use machine. But I bought it to mostly run fridges when mains power goes, only problem is I need to top it up with fuel every 4 or so hours which can be annoying when there is a blackout for more than a day. Would have liked a larger fuel tank to get more run time. Simple buy process and arrived in 4 days. Can't flaw My Generator. It starts first time, nice and quiet. The 2400 inverter I bought is great, it's so quiet and the price was great compare to others that I rang. We needed a Gen set in a hurry due to cyclone Marcia so I rang My-Generator. The gentleman I spoke to was great he was so helpful he had the genset on the next available truck. Thank you to all the people at My-generator I will fully recommend you to everyone. Excellent generator started first go with little effort, easily ran two fridges, air conditioner, fans, lights and tv. Easy, good advice, quick to respond to queries. We bought this product mainly to run the air con and coffee machine in our van when not at powered sites. Very happy with it so far. The shopping experience was excellent, wish all internet shopping was so easy. It is always a nice feeling to unbox an item and know from the solidness of the unit that it is good quality. And made in Japan not China! My neighbor has had one of these for 7 years and it has been a reliable and consistent generator and still purrs quietly after years of use. I was amazed by how easy it was to kick this generator over, a 4 year old could pull the leaver to get it started (not that you would let that happen). Pricey unit as are the Hondas, but price from this dealer was by far lowest. Cant remember his name but I left a message with MyGenerator when I called to enquire about the unit and got a return call just a few minutes later. Was friendly and did not sound dodgy whatsoever. Delivery in 3 days! Got to me the day before my creek flooded. Bought this generator to provide power for my caravan. Was concerned around its ability to power my Aircommand IBIS conditioner. However those concerns were not founded and the aircon runs perfectly with it. My Generator were unable to fully answer my query on the generators capacity to start my aircon in my caravan, however they were able to advise on checks I could make prior to purchase. Found this very useful. Already owned the EF2800 , wanted a slightly quieter model to take caravanning. Good price, arrived on time and well packed. Nice and quiet and runs caravan air con with ease. Couldn't be happier with the purchase. Easy, no hassles at all. Steve more than impressed with your service. Not your fault that TOLL the idiots held the Generator in Perth, didn't send it on for a week,and their phone manners and service were notoriously bad. I have purchased Yamaha products in the past, specifically a Yamaha 115HP V4 outboard motor and a Yamaha Royal Star 1300 motorcycle.Therefore I knew I was dealing with a quality manufacturer to start with. Having purchased the 2400w Inverter generator my faith in Yamaha has only been strengthened. It is a fantastic generator delivering everything promised with no disappointments. This is rare in todays planned obsolescence environment. I purchased it on line from My Generator and I was pleasantly surprised by the ease of ordering and the prompt delivery time, especially as I live on the surf coast with some suppliers deliveries blowing out way beyond promised dates. The Yamaha 2400 inverter genny has so far met all our expectations. It run for 5 days straight when camping recently. Very quiet, efficient with plenty of power to run fridges, a/c kettles etc. It had to be quiet and fuel efficient and it has worked very well the whole time. We'll be using more of it going forward. It gets a little heavier when you fill up the tank, but two of us can lift it easily when needed. Thank you to Sean at My Generator for talking me through the buying process for this generator. He was most helpful understanding our needs to run power for our pop-up bar and also talked me through the generator start-up process when it arrived. Thanks again. The generator is for backup power in cyclones and outages, put the oil and fuel in and it started on second pull. Runs well and seems very economical with fuel, not too noisy. Much better product that previous Stanley generator. The whole purchase process was smooth and flawless, goods delivered to Darwin very quickly and in good condition. I'd heard a few horror stories about generators so chose this one as a few others from my caravan club talked about it - it arrived a day later than initially indicated, but this site had the best price I could find. Followed the instructions and started first pull. No issues to date and am pleased I went for this model. Our Caravan Air Con is about 6000 Btu and we freestay quite a bit so this unit is a must have for hot nights. It runs very well and when the Amp/Watt need arises, this generator reacts quickly and the engine responds almost instantly. The sound is quiet enough to be drowned out by the A/C. I've run a few other smaller things at the same time like phones and a small TV, but haven't wanted to overload it with much more. I'm very confident in this unit and highly recommend it. Runs everything: Freezer, 37 inch TV, two lamps, fan and refrigerator at the same time...check. 1600 watt space heater....check. I plugged the fridge and freezer in separately to avoid startup amps at the same time. The high capacity feature seems to allow the engine time to speed up before the increased power draw hits it. My old generator would drop RPM till it caught up, which made me worry. Quieter than my last unit too. This was the best site I could find for information and was also the cheapest...obviously doing somethings right! Happy to recommend, Tom. I did quite a lot of research and am very pleased with this purchase. This unit runs the Air Con in my Motorhome (13500 BTU) and other bits n pieces. It's very quiet and economical to run (about 8 hours on a full tank). I bought this for when I race my bike at Qld Raceway. I run a set of tire warmers and a battery tender with it, and it has plenty of power to spare! Opened the box, added oil and fuel, and test ran it for about a minute. Took it to the track and it ran for about 6 hours each day with no issues at all. This gen is super quiet! I had to walk up to it to make sure it was still running. Definitely gets the nod from me. Have now used the generator for back up heating in winter and on a few caravan trips. Wanted quality and got it: thanks for the advice Lachlan. Quiet when running and drops down to idle when only using a small amount of power like our TV. Always starts straight away. We have an LG air con unit on our pontoon house boat and needed to keep the young ones cool inside. Thank you Steve @ My Generator and your explanation for what I needed. Running it has been easier than I thought it may have been. I've been using yamaha gensets on the farm for over 10 years, so it was a no brainier to get another EF2400 with the parallel kit for my existing one when I needed more power for a dam pump. No better brand in my opinion. Q:How much fuel does it need to run? And how many beers do I get with my generator? cheers mate. Hi mate, thanks for your question. Regarding fuel: the Yamaha EF2400iS has a six litre fuel tank and runs on regular unleaded fuel. This will give you a run time of nine hours at a quarter load. This unit recently topped the Caravan & Motorhome on Tour Magazine massive generator comparison test, including the most fuel efficient measure - you can see the results here. In terms of the free beer: from time to time (depending on stock levels) we run a sales campaign in which we give away a free carton of beer when you purchase a selected product on our site. We also run other bonuses at different times including free generator covers, free shipping, reduced pricing, or other giveaways. Typically these specials are for a very limited time only, so if you like the deal; grab it why you can! Q:Can two of these be connected together? I need 3500 watts to start my A/C unit. Howdy Sam, yes you can - the Yamaha EF2400iS is Twin Tech compatible, meaning with the parallel cables you can connect two of these generators to almost double the peak output and provide 3800 watts continuous. You can purchase these cables listed as ‘Parallel Kit’ under the Accessories List on the product page. Cheers! Q:Do you think a generator cover is necessary to maintain the unit in the best condition? Most of the time we would have the generator stored within our caravan. Hi Cam - the generator cover is best for those who will be storing the unit in a garage or shed as to protect it from dust. You cant use it when the unit is operating and the covers are not weatherproof. Given your generator will be in a small caravan storage enclosure, I would say a cover is not absolutely essential for you, particularly if your storage compartment is clean and protected. Another quick tip for generator protection is: If you have the generator placed on the ground, always sit it on a board when running. This prevents the dirt and dust being sucked into the machine from the ground. Hope that helps - thanks! Q:A mate recommended this generator to me - I've got 2 freezers that I need to keep running during blackouts. They are the same identical model and manual says they draw 1080 watts maximum. Will this Yamaha do the job for both? Ta. Hi Michael - yes, based on those wattages you have described, the Yamaha EF2400iS will run both of your freezers. Cheers. Q:I have an Air Command Ibis air conditioner in my caravan. Will a Yamaha 2400 start it? Hi Ken - The short answer is yes; the Yamaha EF2400iS is the most popular generator model for running Caravan A/C units. Ideally you would know the starting and running wattage for your particular air conditioner model to be sure you are choosing the most appropriate sized generator. We find the best way to get this wattage information is to contact the manufacturer (Air Command). Their service dept. is very helpful and for most of their range of air conditioners they will advise around a 2.4kVA to 2.8kVA generator, with the main caveat being that external factors such as high temperatures (above 30°C) and long extension leads (over 3-4 metres) can de-rate any generator's power capacity. Also keep in mind that if you want to run other appliances at the same time (or simultaneously charge your battery system) then this extra power needs to be taken into consideration when sizing your generator also. In summary, the Yamaha EF2400iS will run your Ibis Air Command air conditioner, but if you need a bit more power to account for hotter temperatures or additional appliances then the Yamaha EF2800i could also be considered. For extra piece of mind and to discuss your particular model/situation you can contact your air con manufacturer (Air Command) or feel free to give us a call on 1300 400 122 to discuss more. Thanks! Q:What generator size and types can run a caravan airconditioner? I also have the fridge, TV, radio etc. Hi there - thanks for your question. For your air conditioner, it is probably best that you contact the manufacturer or find on the A/C unit the particular wattage power required at both start up and for continuous running (often the start-up power can be 4-5 times the running power). That is your first step. We find the Caravan air con manufacturers (Technical departments) to be very helpful providing the starting wattage info if you give them a call. For popular Caravan A/C brands like Air Command, Dometic, Coleman etc. we find the Yamaha EF2400iS to be the most popular model - it is a great performer for this type of application. Just remember that if you want to run other appliances at the same time (see below) or will be operating your generator in hot tempuratures (above 30°C) / running extension leads beyond 3-4 metres then all these things need to be taken in consideration when choosing your generator size - we advise the best thing to do is work out the wattage draw of your A/C and any other appliances and make sure you have some extra power up your sleeve if needed. Overall, do your sums on all your appliances (A/C unit and other) and make sure you choose a generator with enough power for your particular items and situation. Again, our most popular generator for caravans is the Yamaha 2400 Watt Inverter Generator with some people opting for the Yamaha EF2800i for a bit more power. Each person's caravan set up and circumstance varies. There is also a cheaper budget option being the Lectron 3500 Watt Inverter Generator which is suitable for infrequent use only - Yamaha is premium brand with a 4 yr warranty and national service support network, Lectron is a cheaper brand with no national service network; mainly designed for 'just in case' purposes. Q:What size generator would handle my Caravan air con? The unit has a nominal cooling capacity of 3.0 kW and run at a frequency of 50 Hz at at all times. Hi - sizing the right generator for caravan air-conditioning units is a very common question. Firstly, you need to find out the starting (peak) watts of your particular unit; we suggest the best way to do this is to contact the manufacturer of your air-con unit and their technical department will be able to inform you what the exact starting wattage of your model is. For many common air-con manufacturers such as Ibis Air Command, Dometic, Coleman, Mitsubishi etc. the technical departments have tested their range of units against leading portable generator models and can advise what size generator will best do the job. For the vast majority of popular caravan air-conditioning units, the advised generator size is 2.4kVA to 2.8kVA. The most popular generator model is the Yamaha EF2400iS - it is a great performer for caravan use (including running caravan air-con units) and was rated by Caravan & Motorhome on Tour as the best Caravan Generator. For people that want more power, the Yamaha EF2800i or the Yamaha EF3000iSE are good options. Q:Is the warranty on this product a factory warranty from Yamaha? Yes, you get the full manufacturer’s warranty from Yamaha Australia which would be covered by any local Yamaha service center that works on generators. Q:Thinking about buying your Yamaha ef2400is generator and need to know is freight insurance included in your delivery? if not what's the cost? Hi Glen and Sharon, yes all of our items are fully insured during freight. Many thanks! Q:Will this generator run my caravan air conditioner? Hi there - we get this question quite a bit. The Yamaha EF2400iS is the most popular generator for caravans, especially because it will run most caravan and motorhome A/C units. We've tested this generator against the most popular A/C models from the likes of Air Command, Dometic, Coleman etc. and it is a strong performing generator. However, we always advise that because each A/C unit is different you should find out the wattage requirements for your particular unit to ensure you choose the best suited generator. Often the best way to do this is to contact the A/C manufacturer and speak to their technical department. It is important to note that many units will have both a start-up power requirement in addition to the continuous running power requirement (the start-up power can be 4-5 times the running power). Overall, we confidently recommend the Yamaha EF2400iS for Caravan A/C use. But just be sure to do your sums on the starting wattage draw of your A/C model, and do the same on any other appliances you intend to run also. Each person's Caravan set up varies from one to the next. It's also worth noting that this generator recently topped the Caravan & Motorhome on Tour Magazine massive generator comparison test, you can see the results here. Q:Will this generator run any Caravan Air Con unit? We always advise that you find out what the peak power surge at start-up (in watts) that your particular Caravan Air-Con model will require. This enables you to correctly size what generator you need. Often the best way to do this is to contact the Air-Con manufacturer, speak to their technical department and ask what size generator they advise will run your model of Air-Con, based on its peak power surge. In terms of the Yamaha EF2400iS, from our testing and experience, it will run mostly all Caravan Air-Con models from the major brands on the market, noting that there are a couple of specific Caravan Air-Con models at the very large end that will test it, or even be too much for generators of this size especially in hotter conditions. Note that some older Air-Con models are not very efficient and can draw quite a bit of power. 1) They have an especially large Caravan Air-Con unit that needs more power so they need a larger generator (or in some less common cases the opposite is true, whereby they have a particularly small Air-Con unit and can get away with a 2000w generator). Again, these types of cases are not as common, but its always best to find the peak power surge draw of your specific Air-Con model. 2) Many people will just want to run their Caravan Air-Con from the generator and that’s it. However, some people will have a number of other Caravan appliances they want to run at the same time as their Air-Con, e.g. battery system charging, kitchen appliances, electronics etc. This is where you'll need to know the power draw of those other appliances also. The Yamaha EF2400iS might be ok to run your Air-Con plus some other appliances at the same time, or it might not - it obviously depends on how much power the sum of all your particular pieces of equipment will draw. Lastly, its worth noting that in hotter environments, any generator's capacity will slightly reduce. Also, the longer the extension leads, the more the generator's capacity will slightly reduce too. Just be weary of these additional influences on the power performance of a generator - so if you are going to be in particularly hot environments (above 30 degrees Celsius), or run long extension leads (longer than 4 metres) then factor in some additional power contingency when doing your generator sizing calculations. Hi Andrew, the Yamaha EF2400iS and EF2800i models are made in Japan. In terms of parallel connection, this is possible for the EF2000iS and the EF2400iS - only these two models in the Yamaha Inverter Generator range have the parallel connection capability. Note that you need to connect two of the same models for it to work...so with your existing Yamaha EF2000iS, you would need to connect it (via the Yamaha Parallel Twin Tech Cables) to another EF2000iS, and this would almost double the power output. You can't connect an EF2000iS with an EF2400iS. Q:What is the power factor please? Hi there - The power factor for this inverter generator is 1. Max output is 2400w or 2.4kva. Rated or continuous output is 2000w. Q:Hi, how much does this weigh please? Hi - This generator weights 32 kilograms. You can see the full product specs under the 'Specifications' tab on this product page. Thanks! Q: Will the Yamaha EF2400iS run my Caravan Air Conditioner? The Yamaha EF2400iS is by far and away the most popular generator to run caravan air-conditioners. It will start and run most caravan air-conditioners on the market, and it was awarded the number 1 caravan generator by Caravan & Motorhome on Tour Magazine in their mega caravan generator test. Typically, most caravan A/C units will require a surge power amount of between 2000 – 3000 watts, and the Yamaha EF2400iS can handle that surge requirement. However, there are some larger makes and models of Caravan A/C’s that may require more power and so it always pays to contact your A/C manufacturer, speak to their technical department and ask them what generator size is recommended. The majority of our customers wanting to run their caravan A/C from a generator will opt for a generator around the 2400 watt size (like the Yamaha EF2400iS). The small balance of customers may need a bigger generator (again, we encourage you to check with your caravan A/C manufacturer about your particular make & model) like a 2800 / 3000watt model, or can get away with using a smaller 2000watt sized model – although in this latter case, it may still to pay to opt for a larger generator (like the Yamaha EF2400iS) as it can be beneficial to have extra power up your sleeve; external factors such as hotter outside temperatures and extension cords will slightly de-rate any generator’s capacity. Q:If I buy this generator how will I connect it to my caravan? Does it have a 15 amp outlet to match caravan power lead? Hi Paul, the Yamaha EF2400iS Inverter Generator comes with 2 x 15amp outlets for you to plug in your caravan power lead. Many thanks.